Walsine Pierce: A SPECIAL CHRISTMAS CARD: Thank You, Sarah! "Tis sweet to be remembered by loved ones far away"
Thus the words of the song that, in my youth, my dear, dear friend, Iolene, would sing for me as she plucked the strings of her old flat top guitar. I loved Iolene and I loved that song. Still do! She would also sing "River of Memories". I remember, Iolene! Rest in peace. I love getting Christmas Cards which reminds me of my many other dear friends. A few include letters or personal notes. WONDERFUL. We display them prominently around the inside and outside of the archway from the dining room into the living room. Normally, Julie mails out hundreds of cards. For what reason I do not fully know, she did not mail cards this year. The reason probably falls between her working long hours, seven days a week and the fact that she doesn't feel all that well. If you normally do but this year did not get a card from us, please have a bit of charity. The reason for crowding this blog into maybe a thirty minute time frame until I must get ready for our churches Christmas Eve service is that I am so excited about it and want to share it with you. The card was hand addressed to Walt Pierce. In bold script across the front of the card was written "God Bless You, signed "Sarah Palin". The printed message wished us a Merry Christmas and a Blessed New Year! It was signed "The Palins - Todd, Sarah, Track, Bristol, Willow, Piper, Trig and Trip". WHAT A TREASURE THIS IS TO ME! 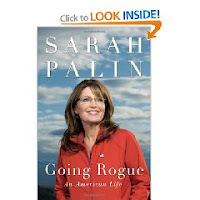 After reading her book, 'Going Rogue' I felt compelled to write her a brief note of "congrats" and appreciations. The Christmas card was her reply. I CHALLENGE ANYONE, REGARDLESS OF POLITICAL POSITION, TO READ THE FIRST 104 PAGES OF HER BOOK AND NOT RESPECT THE PERSON THAT SARAH PALIN IS. I ALSO CHALLENGE ANYONE TO READ THE BALANCE OF THE BOOK AND NOT BE THANKFUL THAT SHE MAY NOW BE IN A POSITION TO DO FOR THE NATION WHAT SHE HAS DONE FOR THE GOOD FOLK IN ALASKA. Wow! How cool is that! My dad will be so jealous. He adores her. He's reading her book right now and is going to pass it to me. I look forward to reading it. She is a remarkable woman!